IMAGINE what it would be like to turn your back on the nine-to-five drudgery of normal working life and risk everything you’ve ever had on the fate of a horse race or the outcome of a ball game. In the gambling fraternity, Harry Findlay has earned legendary status. He has been skint dozens of times, won over £20 million and spent just as much. But he will not change. Fearless and formidable, bullish and bombastic, there is no one in the gambling game who can match Harry’s style and seismic impact. When he first ran a betting slip through his fingers as a 16-year-old, Harry said he had been handed the keys to the Magic Kingdom. Gambling has taken him all around the globe, enjoying five-star travel and a gourmet’s indulgence at the world’s biggest sporting events. In his much-awaited book, Harry recounts the mind-boggling tales behind the thousand and million pound multi-sport bets that will make ordinary punters shudder – including the day he wagered £2.5 million on a rugby match. It is a remarkable life story of ups and downs. Aged 21 years old, he served nearly a year in some of Her Majesty’s toughest jails. Who’d have thought he would go on to own Big Fella Thanks, winner of the Derby at Clonmel and the most famous dog to come out of Ireland – and be part owner of the legendary racehorse Denman, who carried his colours to Gold Cup glory. Harry’s subsequent controversial disqualification from racing destroyed him, despite the ruling being overturned on appeal. Most fascinating of all, Harry tells how he has survived and continues to work his magic in the gambling world, and still believes in his own special talent to read sports events and to continue to stay one step ahead of the internet companies that flood our minds with the temptation to risk so much. 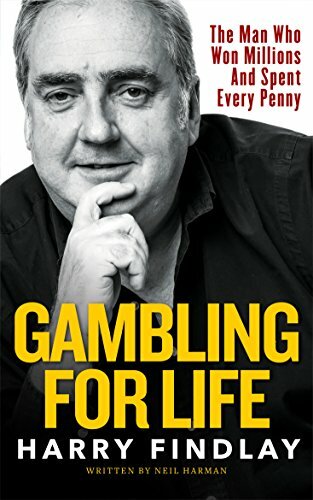 Harry Findlay: Gambling For Life reflects one man’s extraordinary passion for gambling. How he cannot live without it. And how he knows that, even if he loses all of his money, he can never be a loser.